The Western Ring Road, informally referred to as the M80 Ring Road, is a freeway in Melbourne that connects the suburbs in the northwest to each other without the need for having to travel through the CBD. As the Western Ring Road also links other freeways; including the Tullamarine freeway, the Hume Freeway and the Calder Freeway, it is a critical part of Melbourne’s transport infrastructure as it helps manage freight traffic from various roads, and channels this traffic to the outer suburbs. To the east side of the Western ring Road are a number of suburbs which are connected to the Western Ring Road through the Metropolitan Ring Road. These two freeways join to make a long single freeway which stretches from Greensborough in the north-east to Laverton in the south-west. For travellers, the importance of the Western Ring Road is that it can make travel to the airport from the north eastern suburbs very easy as the Western Ring Road joins with the Tullamarine Freeway which services the Airport. The total length of the Western ring Road spans 38kms. Across the freeway, one of the most notable features is the EJ Whitten Bridge that crosses over the Maribyrnong River which has stunning views, particularly at sunset. Average travel time across the M80 ring Road is half an hour, which increases during rush hour. 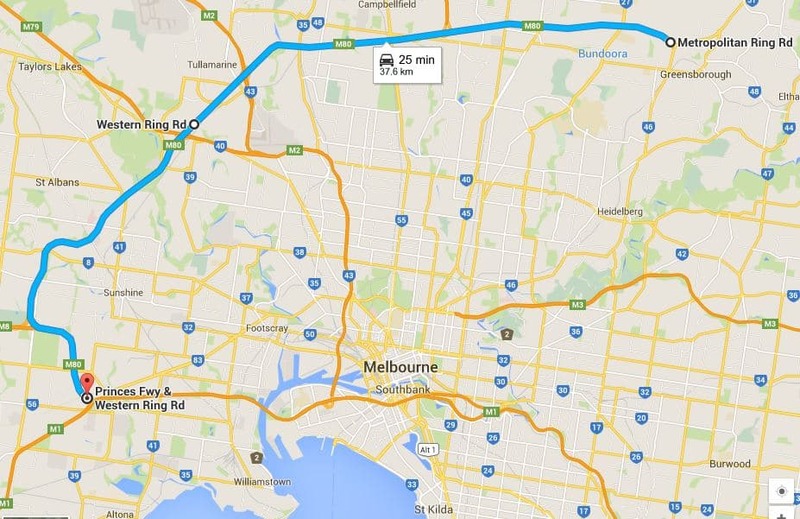 Do I use the Metropolitan Ring road to go to Ballarat. I am coming from Heidelberg. Looking at Google maps, odds are you would be using the M80 Metropolitan / Western Ring Road to go from Heidelberg to Ballarat. Odds are the most optimum route will be dependent on the time of the day you wish to travel and also traffic at the time, but looking right now when the traffic is low, Google suggests getting on the Ring Road near Greensborough, and then travel along it until you reach the M8 National Highway. Alternative ways could be travelling down Bell St / Calder Freeway to reach the Ring Road, or even going south to reach the Monash and going over the Westgate Bridge. I’ll drive to Melbourne from Adelaide after new year, which route would be better to get to Sydney Road and Brunswick after I get off from A8? I used to go all the way along Ballarat Rd and get through to Brunswick and now am thinking to use Western ring Road. Which one would you recommend? The Western Ring Road is about 10 minutes quicker if the traffic flows at normal speed and you can generally keep a constant pace. However there are some ongoing roadworks on the Ring Road (near Furlong Road) which can clog things up during busy periods, so I would only travel on here outside of peak hours (ie: outside of 7-9am weekdays). Any other time should be fine.